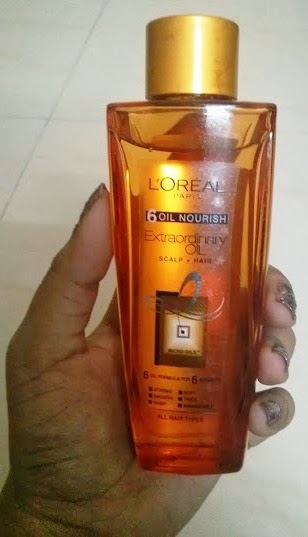 So I came across this new product launched by L'Oreal - The 6 Oil Nourish that, as the name states, has the benefits of 6 oils all in 1 product! Of course I had to try it! Because nothing is ever enough when it comes to hair care. My review is based on 2 applications, I am sure a better review would be possible only after using it for at-least 2 months. But this is more for people who are not certain whether to buy it or not. They are not very clear in mentioning whether it is to be left overnight or just apply & wash. But what I did was apply it an hour before washing my hair. It gives great results! So no more sleeping with greasy hair! It is not greasy, even when you have left over on your hands, it gets absorbed really quick! The benefit of 6 oils targeting different aspects of hair issues is the biggest plus. No more being confused to use Coconut Oil or Almond Oil or Olive Oil. This product has all three and 3 more namely Argan, Jojoba, Camelina Oil. After my hair was dry, they felt really smooth & silky. And added proof to that when people saw or touched my hair to claim the same! It remains silky next day too! Love that! They claim that you can use it as a after wash 'serum' like product too. Gives your hair a shine without looking oily. So there, you have a Oil & Serum both in 1 bottle! Can be used for all hair types, but I guess thats a common USP for most hair oils. The bottle is made of glass or some tough glass like material. Though it looks all classy, I don't understand why they thought of this packaging. I say so because one usually wants to "squeeze" the oil out, but this does not allow that. You have to pierce the bottle and then allow the product to come out in drops. Also, when you are using it you tend to make the bottle slippery and it can fall out of your hand, not sure if it would break, but it could. Dove Elixir also is a Glass bottle but it comes with a pump. I would have preferred a bottle that I can squeeze and get my desired amount of oil in one go. If the bottle is not an issue, the oil is a gem of a product, to be treated as sacred. Go for it. I am sure I am going to have thicker, silkier and happier hair in a couple of months! 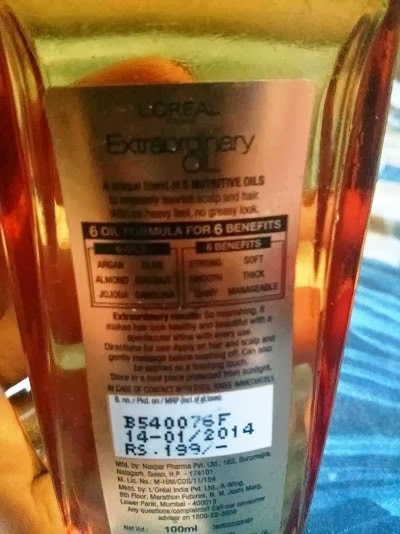 Thank you L'Oreal, it truly is extraordinary.